There’s been a pretty active discussion on #NoEstimates over on twitter. There seems to be a fair ammount of people interested in learning more about how it is applied. Me, I’m interested in developing #NoEstimates further. How? Last week I put out a call for action. I asked people to post questions about #NoEstimates with the #NoEstimatesQuestions hash tag. Below I list the questions I got and what I believe they mean (after all, twitter does require some parsing as you will see). Read on for the questions on #NoEstimates from the twitter community. This is a question that I get quite often. At the core of this question is the need for some kind of recipe for practicing #NoEstimates. Many people getting started want to know what steps to follow (Shu-level). Unfortunately many of the #NoEstimates practitioners are beyond that level, and I do think that providing recipes to get people started, is a task that our community needs to take on. How does a Shu-level practitioner get started with #NoEstimates? I hope to write a few posts on this during the next few weeks. 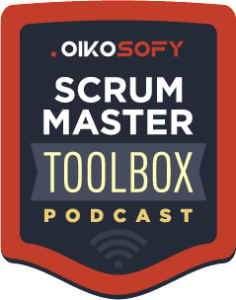 How to practice NoEstimates in companies where estimates are “mandatory”? This questions is related to the previous one, but it adds an interesting twist: “my boss requests estimates from our team, how do I use #NoEstimates in that case?” I’ll have a few tips on this in a later blog post. This is likely to be a very common scenario for people learning about #NoEstimates. How does #NoEstimates fit with GAAP accounting rules? In most organizations, certain standards for accounting must be followed. Stock-exchange listed companies particularly, need to follow GAAP accounting rules. It is only natural that we must provide some guidance on how #NoEstimates can fit those contexts. As I’m not an accounting expert I would really like (and need) to find someone that would help us create some guidance on how to reconcile GAAP accounting with #NoEstimates. I know it is possible, but we need an expert view on the topic. Do you know anyone? Are you a GAAP expert? Ping me on twitter and let’s talk. How to know when a project is finished if we don’t estimate? This question comes in many forms, this is just one way in which I get this question asked. The thinking goes: if we don’t estimate how is it possible to know when we will be done? Additionally, this question seems logical at first blush. But it isn’t. 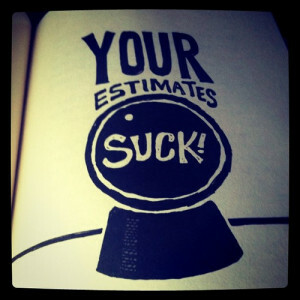 Estimates are a very poor way to determine when projects will end. In a company where I worked, we listed all projects in a 2 year period. In this total of 17 project the average delay to estimated completion date was – are you seating down? – 67%. Yes, 67% AVERAGE delay. So, it is possible to know when the project will end by using #NoEstimates, and I’ll claim that it is far more accurate than using estimation to determine completion date. But that is content for another post. Stay tuned. How can we decide to start a project if we don’t have an estimate for the time it will take? Another very common question, a fair question for people that are getting familiar with #NoEstimates. I hope to clarify that the assumptions underlying this question are not valid, and provide a set of ideas that will allow decisions to be made without going through estimation-driven cost assessments. How does the #NoEstimates concept fit with contract negotiation? Recently I’ve been getting questions regarding the use of #NoEstimates in a contracting environment. This is a questions that affects outsource or subcontracting relationships and as such, it affects a large portion of the software industry. I’ve been following what Jacopo has been doing in his application of the concept of Black Swans to contracting. I think that we can apply some of his lessons learned to the #NoEstimates concept. This will, I hope, clarify how #NoEstimates can be applied to contracting in a way that benefits both sides of the contracting relationship. How do I know that my budget is reasonable? If you are developing software with the help of a third-party you will inevitably ask yourself: Is the budget they request reasonable? As I understand this question it tries to find the “sweet spot” of project cost so that the vendor does not rip you off, but at the same time they are motivated to keep their developers in the project long enough for you to get the software you need with the right level of quality. I believe that this kind of trade-off is fundamentally flawed, and I hope to provide ideas on how we can find new ways to contracting software that are beneficial to both vendor and buyer, but also support the use of #NoEstimates. These are some of the questions that I’ve collected from twitter, but there are plenty more to come. In the next blog post I will cover the second part of the list of questions received. After that I would like to engage with you here on the blog to try and answer each of these questions from the #NoEstimates point of view. Stay tuned and be active, asking further questions as well as providing your insights and challenges to the answers I’ll provide. These days firms are focusing on providing software solutions even for the small business to increase their profitability.You too can try it.